Seems like you’re not the only one to have noticed their talents. Another job offer is on the table and they are handing in their notice. One side of you is not surprised; another side thinks ‘well, that’s great for your career!’; but most of all you want to tear the letter up and insist that they spend the rest of their career with the company! How should we manage it for the best mutual results? Even if the employee does end up leaving, the learning experience for you and the organisation can be really valuable. The heart’s beating faster as the pangs of disappointment start to bite. But take a breath and remain cool. Listen carefully to your employee. The decision should not be seen as a personal affront. Try to put your emotions to one side and don’t over-react. Whatever you do, don’t immediately offer more money! You need to find out the reasons why your employee is handing their notice in – don’t assume that you know. But also don’t assume that you can gather all the necessary information there and then: there may need to be a follow-up meeting after the dust has settled and everyone has had time to digest it. Find out WHY they’re leaving…really! The first reasons given for leaving may not be the complete or underlying reasons. Use open questions to gather more information. 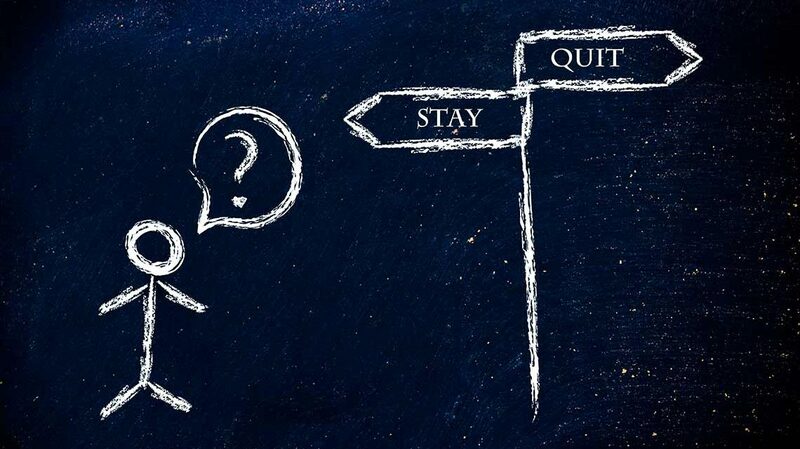 Your employee may be reticent in telling you the real reasons why they are leaving. Don’t ask “Are you leaving because of X, Y, or Z?”. Instead ask “What brought you to this decision?” and follow up with “tell me more…” Let them do the talking as much as possible; your job is to elicit information. It may be that they have received a better offer financially – everyone is attracted by a better ‘package’ – but there are many other reasons why people leave companies. In fact, money is well down the list in most HR surveys: lack of opportunities to advance careers, lack of recognition, and a poor company culture are all amongst the most compelling reasons. Find out the top reasons why employees leave in this blog post from earlier this year. This is obviously linked to Step two. It may be that the employee is unhappy with aspects of their role at your company; but it could be that they just find the new offer more attractive. There are nearly always ‘push’ and ‘pull’ factors at play and you need to find out which are the most dominant in this case. Bear in mind that employees have been known to invent new roles as a bargaining chip with their current employer. It’s important to ascertain whether the new job offer is real and, if so, why it’s so attractive. Find out what they will be doing, who they will be working for, when the new job starts and other details like this. If it’s about money – will matching the offer make a difference? …then find out if it will make a difference to their decision? But be very careful with this. If it doesn’t make any difference whether or not you match the offer, you have not unearthed ALL the factors in the decision – and you may want to dig a little further to find out. Your employee may be seeing everything negatively because they have been ‘blinded’ by the new offer. Try restating the benefits of staying with your company (with or without an improved package). Re-educate your employee on how they are an important part of the organisation and restate the vision and ambition of the company. Share information about what’s coming up in the near future, if appropriate. Get them excited again about working with you. If personal development and career opportunities are important, then mention the extra training that can be arranged and help them see a career path ahead. If they still want to leave – help them go gracefully! Some employees will be set on handing their notice in and there is nothing you can do. If this is the case, make sure that the exit process is smooth and that there is no bitter taste in their mouth upon departure. You never know when your paths may cross again! Let them know the procedures involved, wish them luck, and stay in touch! Maybe even set up a farewell party to make their final memory of the company a sweet one! Ideally, hold an exit interview that will allow you to gather more feedback. In the intervening time, you can think about the best way to gather all of the information you need to make departures like this less likely in the future. Often you’ll find people more amenable to stating the real reasons why they leave when they’ve overcome the initial fears of breaking the news. It might be that some simple fixes that are required; often, the issues will be more complex and involve deeper cultural factors that will take considerable time and effort to improve. Either way, you need to know. If you need assistance with reducing high staff turnover or talent drain in your organisation, or even to help with exit interviews, let’s talk! Email me here: ush@ushdhanak.com.